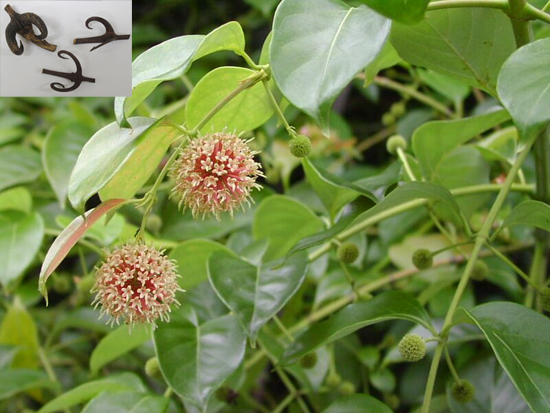 Common Name: Uncaria stem with hooks, Gambir plant, Stems and thorns. Part Used & Method for Pharmaceutical Preparations: The uncaria stems with hooks are gathered in spring or autumn, dried in the sun and cut into pieces. Functions: 1. To eliminate endogenous wind and stop spasms; 2. To clear heat and pacify the liver. 1. Stirring up of the liver wind by excessive heat manifested as high fever, spasms and convulsions. Uncaria stem (Gouteng) is used with Antelope's horn (Lingyangjiao), Chrysanthemum flower (Juhua) and Gypsum (Shigao). 2. Deficient yin of the liver and kidneys and hyperactivity of liver yang or excessive heat in the liver meridian manifested as dizziness, vertigo, blurred vision and headache. Uncaria stem (Gouteng) is used with Scutellaria root (Huangqin), Prunella spike (Xiakucao), Sea-ear shell (Shijueming) and Chrysanthemum flower (Juhua). Dosage: 10-15 g, decocted in water for an oral dose. Not to be decocted for a long time. Cautions & Contraindications: This herb should not be cooked for a long time.